Make a meaningful impact in the life of a child! 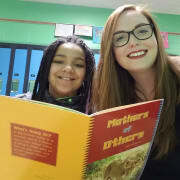 We are seeking volunteers (age 21+) who would like to mentor one student, one hour per week, during the school day through Kids 'n Kinship’s school-based program in Apple Valley, Eagan, or Rosemount. You could work on spelling words, math, a science project, reading, or enjoy lunch together! Ongoing training and support are provided.